Elgin Sweeper, the leading manufacturer of street sweepers for general street maintenance, special industrial and airport applications, has introduced a consolidated platform on the Eagle® mechanical broom sweeper. This platform incorporates the best features, systems and components of the Eagle, Broom Bear® and Road Wizard® sweepers that make up the company's four-wheel mechanical sweeper line. The redesigned sweeper features added water capacity, streamlined controls, a wider conveyor, improved dump height and maintenance access, and a choice of cabover or conventional chassis, while delivering the same reliable, heavy-duty performance customers have come to expect from the Eagle since its introduction by Elgin Sweeper in 1988. "As a result of years of extensive customer input, engineering and field testing, Elgin Sweeper has developed a common platform that includes the best features of the four-wheel mechanical sweeper line – along with some additional configuration options not previously available on any of the three models," said James Crockett, sweeper products manager at Elgin Sweeper. Elgin Sweeper customers and sweeper operators familiar with the Eagle sweeper will notice that the new Eagle configuration looks different. The sweeper's exterior now more closely resembles the profile of the Elgin Broom Bear and Road Wizard models. Steel enclosures on the previous Eagle sweeper have been replaced with robust, lighter weight and corrosion-resistant fiberglass enclosures. The new configuration also includes a low-emission, 74-hp (55 kW @ 2600 RPM) Cummins diesel engine – one of the most powerful standard auxiliary engines available on a mechanical sweeper – without compromising the performance of the sweeper system. The Eagle features a high-productivity sweep system mounted on a cabover or conventional chassis with a five-speed overdrive automatic transmission. The standard chassis cab is dualized with OEM parts, including full factory controls, steering, and an OEM gauge package that is identical for both left- and right-operator stations. The Eagle's standard conveyor uses molded-in, full-width cleats that move large debris without jamming. High-strength belt material provides long wear and maximum uptime for a wide range of applications, including highway sweeping, general municipal sweeping, and pick-up of trash, leaves and other organics. The conveyor is controlled from in-cab, in both forward and reverse direction. A built-in washdown makes cleanup quick and easy. The sweeper is also available with an optional elevator squeegee-style conveyor for road construction contractors performing applications such as aggregate and granular material pick-up of gravel and millings. The conveyors are variable-speed-dependent on engine speed, providing maximum on-the-go productivity and ease of cleaning. The sweeper's control console, located between the operator stations, has been streamlined to provide quick, easy access for increased productivity and safe operation. "The 'one-button' automatic return-to-sweep greatly improves operator efficiency," Crocket said. "For added safety, tactile-feel controls allow the operator to control switches while keeping his eyes focused forward on the road." The Eagle is available with an optional dry dust control system that is ideal for industrial applications where heavy, dry materials must be swept up, while keeping dust emissions to a minimum. The 40-psi self-priming diaphragm pump (run dry type) on the Eagle sweeper provides effective dust control. 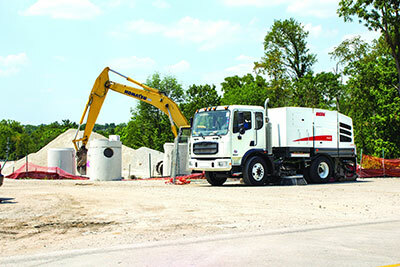 The machine features a 360-gallon, corrosion-resistant polyethylene removable water tank – a 29-percent increase in water capacity over the previous Eagle model – for long sweep times between refills, and a 16-foot, 8-inch (5.1 m) fill hose. Water flow for the side and main brooms is controlled in-cab. "The Eagle was designed so that systems are accessible and easy to service," Crockett said. Large access doors allow for 180-degree accessibility to engine maintenance components. For greater stability and trouble-free operation, the Eagle's 4.5 cubic yard (3.4 cu meters) hopper features a center-mounted, double-scissors lifting mechanism rated at 11,000 lbs (4990 kg). The dumping height is variable up to 10 feet (305 cm). An 11-inch (279 mm) side shift allows for a cleaner, more efficient unloading of material. Payload capacity on the Eagle is 10,000 lbs (4536 kg) per load. A full hopper on the Eagle can dump and retract in 20 seconds for short intervals and up to 70 seconds at top height. Additional options on the Eagle mechanical broom sweeper include side broom tilt, an outside cab with side broom down-pressure control, an outside cab with main broom down-pressure control, side broom speed control, LifeLiner hopper system, strobe lamp, arrow stick, automatic lubrication system, front spray bar and squeegee conveyor with rubber edging. For more information on the Eagle mechanical broom sweeper, please contact your local Elgin Sweeper dealer, or visit www.elginsweeper.com to find a dealer near you. Sold and serviced through a network of more than 100 dealer locations worldwide, Elgin Sweeper products are the sweepers of choice for a variety of general street maintenance, special industrial and airport applications. With more than 90 years of experience, Elgin Sweeper offers municipalities, contractors and industries the most sweeper options in the country, using the latest sweeping technologies�mechanical, pure vacuum, regenerative air, alternative fuel and waterless dust control. 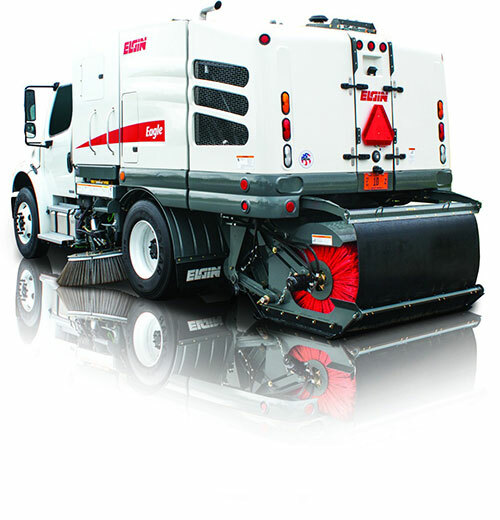 Elgin Sweeper is a subsidiary of Federal Signal Corporation's Environmental Solutions Group. For more information, visit www.elginsweeper.com. Federal Signal's Environmental Solutions Group is a leading provider of a full range of Elgin street sweepers; Guzzler industrial vacuum trucks; Jetstream high-performance waterblasting equipment; and Vactor sewer cleaners and vacuum excavators for commercial, municipal and industrial customers. The Environmental Solutions Group also includes FS Solutions, which offers unsurpassed expertise and a unique breadth of environmental cleaning equipment, parts, rental, service and training to meet the needs of industrial cleaning professionals.